I found this item today at Grocery Outlet San Leandro, while looking for actual Gruyère cheese for a recipe. Normally, I would stay away from anything that calls itself a “cheese product,” but nothing in the ingredient list seemed scary (though it does contain sodium phosphates, emulsifying salts and sorbic acid) so I figured, why not? It was a great choice. This cheese tastes *just* like Laughing Cow cheese, but it’s more solid. You can cut it into slices and have it melt on your burgers. As other processed cheeses, it melts beautifully. It’s also damned tasty to eat by itself – and I’m thinking of including it on my Christmas Eve dinner cheese plate. It turns out that processed cheeses can last a long time because they have preservatives added. Plus they are fattier. Amazingly, a lot of the cheeses we know – such as Mozarella, Cheddar, Brie, Camembert and Swiss – are processed cheeses. Who knew? Amazingly, I haven’t been able to find any references to this cheese in the internet. 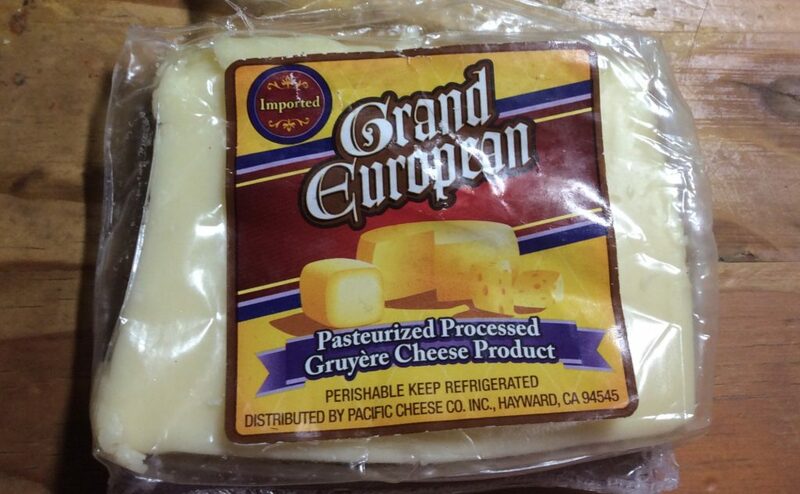 Grand European is a trademark of Pacific Cheese Co., located in Hayward (next door to San Leandro), which distributes it. Costco sells a Havarti and a Gouda with the same label. This Gruyere cheese products says it’s made in Germany. My fear is that this cheese will be difficult to find – cheeses at Grocery Outlet come and go. Fortunately, it’s very cheap ($2.20 for about 7 oz) and it will last until March next year. This year, my father and my friends Lola and Iggy came over for Christmas Eve dinner. It was a simpler affair than in other years, with only eight courses. I decided early on that I wanted to make a cheesecake for dessert – a favorite of my friend Lola. Alas, that means displacing the cheese course to the start of the meal. No matter, the meal flowed perfectly and everything was great. 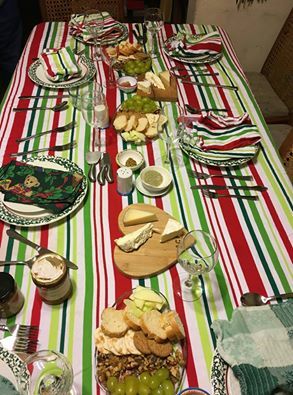 I served a manchego, le Pommier Camembert and Délice de Bourgogne with sliced baguette, crackers, green apple slices, grapes, caramelized walnuts and orange marmalade. The cheeses were from La Fromagerie in San Francisco. Most of us preferred the délice, though my dad liked the camembert the most. Still, these weren’t the best cheeses we’ve had. I spent a lot of time looking for recipes of amuse bouches that I could serve in a spoon, but wasn’t satisfied with any. Finally, I decided to wing it and placed a tiny bit of store-bought polenta on each spoon and topped it with a quick, recipe-less mushroom ragout. Wow, was it delicious. Everyone wanted more! This is an old favorite and was requested by my youngest daughter – who had forgotten it had blue cheese in it and didn’t like it. This time I used Point Reyes blue instead of a milder Gorgonzola, so perhaps that was the problem. Most of us were happy with it. My oldest daughter requested I make this soup. I wanted to try a new recipe, as none of the ones I tried before were that great, and I was intrigued by using one with coconut milk. This one proved to be a huge hit. It was absolutely delicious. I had meant to add some pumpkin seeds for color/texture (instead of the red onions and kale the original recipe called for) but I forgot. Nobody missed them. Do serve this with sour cream. It needs the added acidity to be truly great. And great it is. I made this in advance and then added some water to reheat it. This leek tart is another old favorite requested by my oldest daughter. It’s one of the simplest things you could ever made but also the most delicious. Once again, I made individual tarts to make it more elegant and served the cream in a creamer, so everyone could pour themselves some. I made the filling in advance but prepared the leek tarts the day I served them. Store bought Haagen-Dazs, I’m afraid. We finally get to the main dish! My vegetarian daughters forewent the ribs, but the rest of us were very happy with them. I made them in advance, of course. The buttermilk mashed potatoes are my usually recipe, which I multiplied a few times. The asparagus were simply roasted with olive oil and salt. Being an Argentinian, dulce de leche cheesecake might seem like an obvious idea. And yet it did not occur to me to make it until I finally decided that my choice of peanut butter cheesecake did not fit with the menu above. It’s a good thing I listened to those voices, as this was probably the most delicious dessert I’ve made in a long time. I used San Ignacio Dulce de Leche, which is a great brand, but I’m sure any other would do. Don’t miss the glace, as the cheesecake is not nearly as good without it. I served an expensive California sparkling wine with the first part of the meal and Clos Pegase Atlas Peak 2012 Cabernet Sauvignon, which we’d bought at the winery, with the main dish. They were both delicious. Slice about half the tube of polenta. Bake or saute it until heated through. Place in serving plates. Heat the olive oil and butter over medium heat in a medium saute pan. Once the butter is melted add the shallot and cook until soft, stirring as necessary. Add the mushrooms and continue cooking until they are soft and all the liquid evaporates. Add the whipping cream and madeira and cook, stirring, until it reduces to a thick glace. Sprinkle with salt and paper to taste. Place the mushroom ragout on top of the polenta and serve. Preheat oven to 375°. Line a baking sheet with aluminum oil. Cut the butternut quash in half (or quarters, if easier). Place cut side up on the baking sheet and cover with aluminum foil. Cook until the flesh is soft, 30 to 50 minutes. Cool until you can handle it, then peel or scoop out the flesh onto a plate or bowl and set aside. Heat oil in a soup pot over medium-low heat. Add the onion and cook until golden, stirring occasionally, about 8 to 10 minutes. Add the squash, apple, broth, ginger, curry powder and nutmeg. Bring to a boil, then reduce temperature to low, cover and simmer until the apples are soft, about 10 minutes. Remove pot from the heat and, using an immersion blender, puree until smooth. Alternatively, transfer solids to a food processor or blender in batches and process until pureed, then transfer back to the soup pot and mix well. Add the coconut milk, stir and cook on low for about ten minutes. Season with salt and pepper to taste. Serve with sour cream. Based on a recipe from the New York Times. Sprinkle salt and pepper on short ribs. Let sit at room temperature for 30 minutes. Dust in flour. Preheat oven to 350F. Heat oil over medium-high heat in a large Dutch oven. Working in batches, add short ribs and brown on all sides, removing to a plate as they brown. Pour out all but 1 tablespoon of oil from the Dutch oven and set on medium heat. Add tomato paste and give-spice powder and cook, stirring, for one minute. Add wine and deglace pan. Bring to a boil, then turn down to a simmer, and cook until the liquid is almost completely reduced, about 10 minutes. Add the short ribs, carrot, parsnip, garlic, cilantro stems and bay leaves. Cover with the broth. Bring the braise to a boil over high heat. Then cover and transfer to the oven. Cook for 2 hours. Remove from oven, let cool, and refrigerate overnight. The next day, preheat oven to 350F. Remove pot from the refrigerator and remove and discard the congealed fat. Return pot to the oven and cook, uncovered, for 40 to 60 minutes, until the meat is falling off the bone. Gently remove the short ribs from the cooking liquid and keep warm. Strain cooking liquid into a large bowl and discard the solids. Return strained liquid to the cooking pot, set on the stove over medium-high heat and simmer until the liquid is reduced by half. Taste and adjust seasoning if necessary. Return the short ribs to the liquid, and cook until the ribs are warmed through. Preheat oven to 350F. Butter a springform mold. Line inside with parchment paper and butter again. Using a food processor, crumble the vanilla wafers into a coarse powder. Stir in the melted butter, sugar and vanilla cream. Press against the bottom of the pan and about 1/3 up the sides. Bake in the oven for about 5 minutes. Meanwhile, using an electric mixer cream together the cream cheese and the sugar. Mix in the eggs, one at the time. Mix in the dulce de leche, the vanila extract and the pinch of salt. Pour onto prepared crust. Bake in the oven until it sets, about 50 minutes. Remove, let cool and unmold. Prepare the glace by heating together the dulce de leche and whipping cream and whisking to combine. Once the cheesecake is cool, spread dulce de leche sauce on the top and sides. Note: if it cracks, you can fill the cracks with dulce de leche as well. I grew up loving fondue, and I still love it. It turns out that so do my children, so I make it from time to time. Not only is it delicious, but it has the advantage of being fairly quick to make. Sure, the dippers can take time, but on lazy nights like tonight we just default to bread. Bread and cheese, what can be better? I no longer make the “classic” fondue recipe because I have little desire to hunt for the right cheeses – plus they are expensive! Instead I wing it with whatever cheeses I find that I think can combine well. I like going for two mildish-to-medium cheeses, one slightly sweet, and then a sharper one to elevate the flavor. But really, I wing it. To the grated cheeses I add just 1/2 a cup of white wine (hunting after kirsch is too much trouble), and some nutmeg if I remember. This serve 4 of us and we had more than enough. For those who actually need a recipe, what you do is: Shred or chop the cheese (I just put it in my food processor), mix it with a little cornstarch and set aside. Meanwhile rub the fondue pot with a garlic clove. Set on medium-high and add the wine. Wait until it boils and then add the cheese by the handful, mixing well and making sure it all melts. Bring down the temperature to a simmer, and enjoy! Stilton is probably my favorite blue cheese, and I’ve liked other versions of white stilton with fruits. This one, however, is plain amazing. I was afraid that the ginger would be too strong, specially against what is, when devoid of its mold, a rather subtle cheese, but it’s perfectly caramelized into barely spicy sweetness. This cheese is just delicious, dessert with a capital “D”. Best of all, it’s available right now at the Grocery Outlet in San Leandro for only $3 or so for the 5oz package. 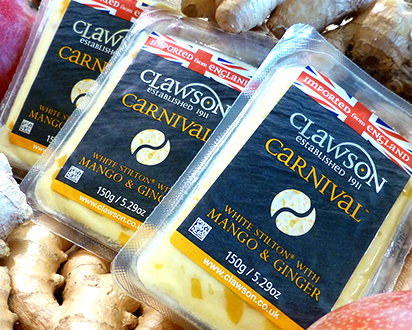 It’s the real Clawson stilton, imported from England, and it has an expiration of July 2014. As with other soft cheeses, it’s creamier as it warms up in room temperature. This one is a bit chalky when cold. 2012 Xmas Eve Cheese Course: Thanks Trader Joe’s! I did my cheese shopping at Trader Joe’s, as it made it easy, so I was able to research TJ cheese recommendations before. The day I went shopping, TJ was offering samples of one of their cheeses and it may very well be my favorite cheese of all times – my daughter also loved it. This is what I ended up serving, in addition to sliced french bread and sliced apples (I also had jams but they proved less popular). Remember that the key to a good cheese course is that the cheeses be close to room temperature, cold cheeses are less flavorful cheeses. – Le Délice de Bourgogne, a triple cream softened ripened cheese from France. It’s similar to a brie, though even creamier than the triple cream brie they have at TJ, but with a stronger, richer flavor. It’s really delicious. – Castello Blue, a triple cream soft blue veined cheese from Denmark. This is a real winner, and a real competitor to TJ’s stilton. I think we all liked it, and was one of my 10-yo’s favorites. – Double Cream Gouda, from Holland. Another all around winner, but not as spectacular as the other two. – Cotswold Double Gloucester with Onion & Chives, from England. This is the cheese that they were offering tastings of and that blew us away. It has an intense flavor, it’s super cheesy and slightly bitter, and just delicious. – Arla Dill Havarti, from the US. I got this at Grocery Outlet and my daughter liked it, but it was mild and boring in comparison with the other cheeses. 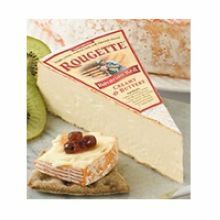 I just found some Rougette Bavarian Red triple cream cheese at Grocery Outlet, and I had to try it. I *love* it. The cheese is super creamy and tastes pretty much like any good brie, though it’s not as bitter as most. It also has a thinner rind. It retails for about $20 a lb, but it was just $7lb at the San Leandro Grocery Outlet. The catch? It expired yesterday (March 1st). Unopened brie should be good for a whole week after its expiration date, but that still means you need to eat it by next Wednesday. Still, if you are around town before then, it’s definitely worth it. I ate it on Sensible Portions Pita Bites, and they went amazingly well together. Dissolve corn starch in 1/4 cup of white wine, set aside. Rub garlic on pot. Put on the burner and add the rest of the wine and kirsch. When it boils, add the grated cheeses bit by bit, mixing with a wooden spoon until they melt, then add the white pepper. If it cools down, add more wine. Once it’s ready, add the corn starch. Mix well and serve. Grocery Outlet in San Leandro is currently selling Rosenborg Danish Blue Cheese at the unbelievable price of $2lb. Really, I’m not kidding. The same cheese sells at amazon fresh for $13lb. Best of all, the cheese is actually very good. It is creamy (when @ room temperature), with a smooth blue cheese flavor, not too bitter and with perhaps a hint of sweetness. We all loved it, and it as fantastic in a Blue Cheese and Caramelized-Onion Squares recipe. The cheese that they had today had been packed on 1/3-1/7 and had a “sell by” date of 1/15th. During the 1970s fondue became a craze not only in America, but in Argentina as well. My parents got a beautiful fondue set and on rare and special occasions they’d go to the expensive cheese shop and create this wonderful dish that we all could share. As a kid I LOVED it – and I still do. As a kid we always ate it with toasted bread crumbs. In Geneva, I discovered that fresh bread was even more authentic – and as a grown up I experimented on different things I could dip in it. The following is the recipe that I use now. The traditional liqueur for fondue is kirsch. That’s not always easy to find and you may hesitate at buying a whole bottle when you only need a little bit for this dish. I’ve substituted it with Calvados or just plain cognac or brandy with great results. BTW, in America all these cheeses are usually available at Trader Joe’s. As a kid, and for many years, I used a regular fondue set with an alcohol burner. A few years ago I bought an electric fondue set and I LOVE it! It’s so much easier to keep the temperature at the right setting! I highly recommend getting one. Shread the cheeses, put in a bowl, add the cornstarch and mix together. Set aside. Rub the garlic on the interior of the fondue pot and leave in. Add wine and heat until boiling. Add the cheese, a handful at the time, stirring until it melts. When all the cheese melts down, turn down the temperature and add the brandy. Take to the table. Maintain temperature to just bubbling while you eat. Serve with: French or sourdough bread, raw broccoli, apple and/or pear slices, sausage slices, mini-meatballs, cooked tortellini and anything else you can think of. I came across this cheese at PW Supermarket and gave it a try. It was wonderful. Though it’s only double cream, it is the creamiest cheese I’ve ever tasted, it’s texture was pure silkness and every bite (on sourdough baguette) seemed like a luxury. I also loved the taste, milder and less bitter than brie. It was quite a hit with my omnivorous 10-month old too.